Now is a wonderful time to take a couple of days or longer to enjoy the waters of Lake Powell. The summer crowds haven’t descended here yet and the daytime temperatures are ideal. Deborah Wall Lake Powell has 1,800 miles of stunning shoreline, much of it suitable for an easy rest stop, swim, fishing spot or camping the night. The lake is within the Glen Canyon National Recreation Area and sits on the border between Arizona and Utah. Deborah Wall There are dozens of side canyons to explore when on Lake Powell. The lake is in Glen Canyon National Recreation Area in Arizona and Utah. Deborah Wall The desert varnish on the Navajo Canyon cliffs lining Lake Powell appear to be dripping and are some of the most fantastic examples of this. During the next month average daily high temperatures are expected to remain in the mid- to upper 80s, whereas for the remainder of the summer they are typically very hot, in the mid- to high 90s. Lake Powell lies within Glen Canyon National Recreation Area, on the border of Arizona and Utah, and boasts more than 1,800 miles of shoreline. 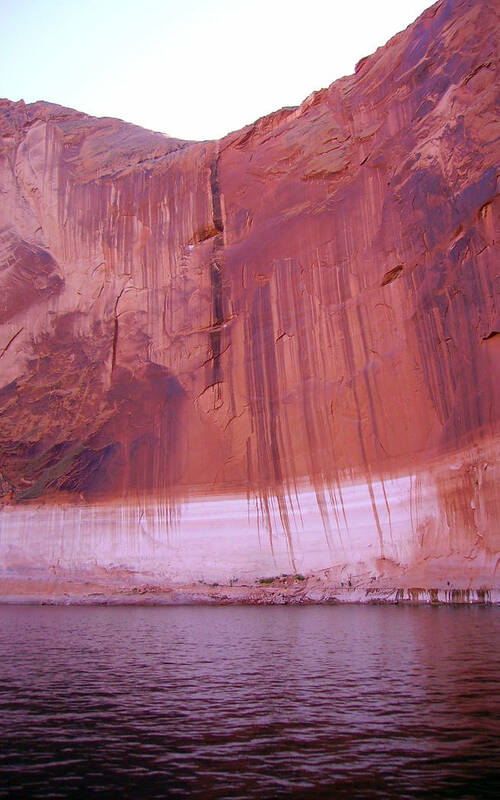 Many of the Navajo sandstone formations and monoliths can be seen from the water although there are also some fine hiking trails to get a closer look. While you are on the water, you will find plenty of sandy beaches to stop at and relax, take a swim or even set up camp for the evening. 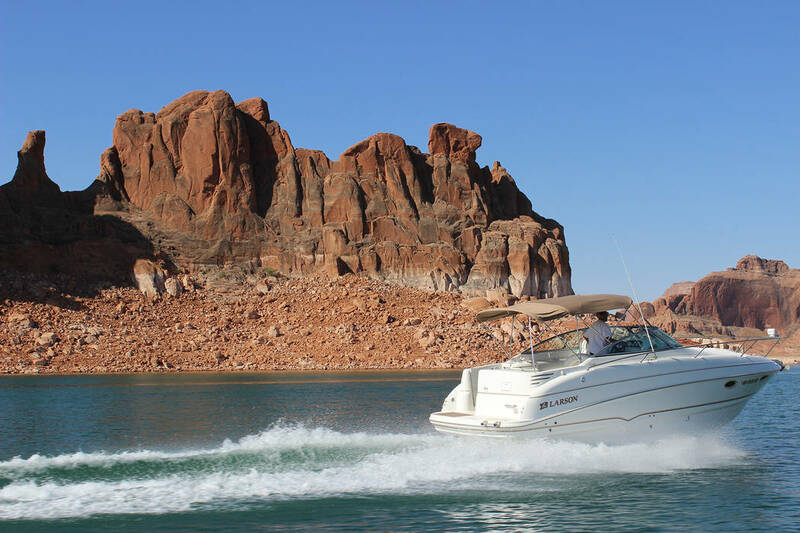 Boating is the best way to visit Lake Powell, and when accessing the lake there are many types of craft, from small fishing craft to ski boats to rented houseboats. If you are uncomfortable with being in charge of your own vessel yet still want to get out on the water, there are plenty of other great ways to do so. I have done a couple of half-day and longer guided day trips, from the Wahweap Marina, all well worth my while. All you need to do is buy a ticket and board the boat and the tour guides take it from there. The most popular trips, and for good reason, are to Antelope Canyon, Navajo Canyon and Rainbow Bridge National Monument. For the crème de la crème, take the tour to Rainbow Bridge National Monument. It takes most of the day — six to seven hours — but the rewards are worth the time. The boat brings passengers about 50 miles up the lake to the dock near Rainbow Canyon. From here it’s a walk of about three-quarters of a mile to see the bridge itself. (The distance is dependent on water level.) This natural stone bridge is said to be the world’s largest, and is about 290 feet tall and 275 feet wide. 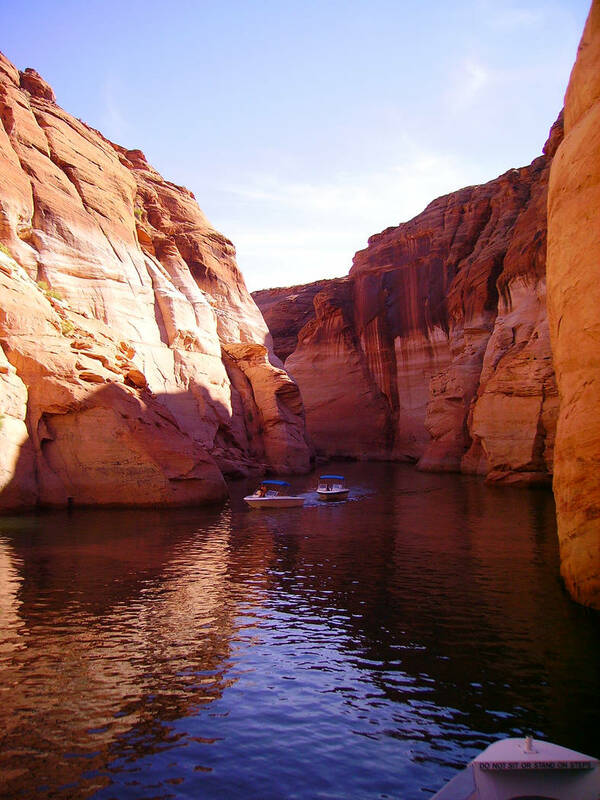 If you are short on time but still want to get out on the water and see some of the sights, there is also a boat excursion to Antelope and Navajo canyons, which takes only 2½ hours round-trip. These narrow and deep canyons have some of the most fantastic examples of desert varnish. Here as well, over the space of unimaginable time, water has carved the sandstone so beautifully that the rock itself seems like petrified waves. All these tours are available from Wahweap Marina. Call 800-528-6154 or visit www.lakepowell.com for details. There are many camping alternatives in the area including Wahweap RV Park and Campground, located about a quarter-mile from the lake. For the closest lodging, there is Lake Powell Resort at the Wahweap Marina, which has rooms, suites, restaurants, a gift shop and a pool. There are also many good lodging opportunities in nearby Page, Arizona. From Boulder City take U.S. Highway 93/95 north to Las Vegas. Exit right onto Interstate 15 north and drive about 125 miles to Utah Route 9 (Hurricane-Zion National Park). Drive 9 miles and go right onto Utah Route 59 east. This 61-mile paved road turns into Route 389 when you enter Arizona, and then into U.S. Route 89A north when turning left in Fredonia, Arizona, just a few miles south of Kanab, Utah. From Kanab, drive east on U.S. Route 89 for about 70 miles to Lake Powell and Page, Arizona.